As a fan of VR I was looking forward to this book. Lanier is often touted as the inventor, father or, more realistically, the guy who name up with the phrase ‘Virtual Reality’. I’m not sure that any of this is true, and to be fair, he says as much late in the book. The most curious thing about the book is how uninteresting it is on VR – it’s core subject. Lot’s on the early failed stuff, and endless musings on early tech folk, but little that is truly enlightening about contemporary VR. My problem is that it’s overwritten. No, let me rephrase that, it’s self indulgently overwritten. I’ve always liked his aperçus, little insights that make you look at technology from another perspective, such as ‘Digital Maoism’ and ‘Micropayments’ but this is an over-long ramble through an often not very interesting landscape. He has for many years been a gadfly for the big tech companies but the book is written from within that same Silicon Valley bubble. Critical of how Silicon Valley has turned out he's writing for the folk that like this worls and want to feel it's earlypulse. He finds it difficult to move out of that bubble. 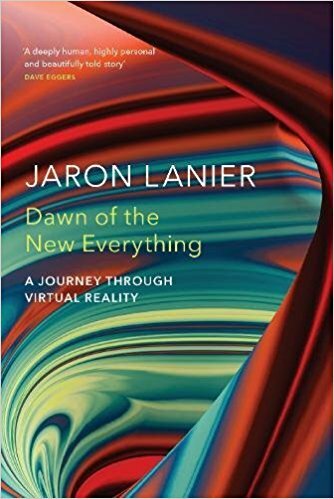 I’m with him on the ridiculous Kurweil utopianism but when Lanier moves out into philosophy, or areas such as AI, it’s all a bit hippy dippy. On AI there’s a rather ridiculous attempt at a sort of Platonic dialogue that starts with a category mistake VR = -AI. No – they are two entirely different things, albeit with connections. Although interesting to describe AI as a religion (some truth in this) as it has it has transhuman aspects, it’s a superficially clever comment without any accompanying depth of analysis. I was disappointed. You Are Not A Gadget was an enlightening book, this is a bit of a shambles.